If you read the intro to this Lenten series, you know I’m reflecting on encounters with God (and if not, now you do). I began with my favorite miracle story, our daughter Annalise’s birth. That felt more like a collision with the Almighty than a brief glimpse as we passed on the sidewalk. The experience changed us. After Saul of Tarsus got knocked from his horse, blinded, and then heard the voice of Jesus, he was never the same. Encountering God so intensely almost always means the stakes are exceedingly high. Yes, those experiences strengthen our faith, but it sounds so tame and sterile to describe them that way. They do, because they almost kill or destroy us, or feel as if they could. They aren’t the only way, of course. We can develop faith in God from having a secure job through which we can pay the bills and recognizing that God has provided everything we need. We could develop a powerful faith through the healthy birth of our children after an “uneventful pregnancy” (which are the sweetest two words in the English language after you’ve survived an “eventful” one–or haven’t). I think our problem with gaining a strong faith through “normal” circumstances is that the evidence looks to us like we are running the show and handling our lives just fine. We don’t always grow in our faith simply from receiving and eating our daily bread, even if we thank God for it at every meal, because we’re not convinced God provided it. Or God provided it, but I helped. Or maybe I provided it, but God helped? Miracles build our faith because we know what we’re seeing and not seeing. Annalise would have died without God’s intervention. I know that. The truth is, God has kept Annalise alive every day since then, but some part of my brain thinks, “That’s the way it’s supposed to work.” We don’t give God the same credit for everyday miracles like life and breath. Yesterday, I walked to school, as I often do. I was praying about my Lent, talking to God about what things I might “give up” to help me grow closer to him. We also discussed the basketball practice I was about to run, the post on Annalise I was still fine tuning in my head, and many of the people I passed. I try to pray for the people I see and ask God to bless them. On my route to school, I walk past a small police station. 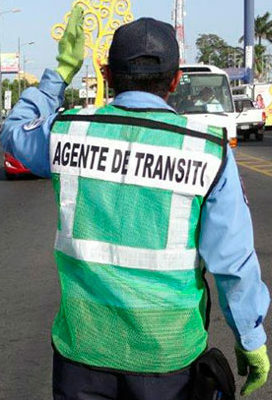 There are usually traffic police (agentes de transito) on duty there. Sometimes they are talking with drivers they have just pulled over. Sometimes they are interacting with each other or staring at their cell phones. When I pass, if we make eye contact, I greet them. Most often I get the brusque nod in return, occasionally I hear “Hola” or “Buenas,” other times they ignore me altogether. Yesterday, the policeman on duty appeared to be working on a police car. * Rarely is there a police car parked at this station, but I’ve seen this car before parked along the road at different points. It’s not in great shape. I walked by and called out, “Adios.” (I like saying this because it counts as a greeting and a blessing.) He stopped what he was doing, looked up at me, then smiled, walked toward me, and reached out his hand. I shook it. He asked how I was, I asked how he was, we both thanked God for being well (“Bien, gracias a Dios“). I told him it was hot–which was evident from my sweaty face–but I was glad for the exercise. I told him “Blessings” (“Bendiciones”), which is my favorite parting; I always try to mean it and it reminds me why I’m here in Nicaragua. So here is my everyday miracle: the traffic police are my enemy. Okay, that’s a bit of an exaggeration. But I pray for traffic police literally every time I see them because I used to feel anger and fear every time I passed one until God finally reminded me, “love your enemies and pray for those who persecute you.” I don’t know how many times I’ve been pulled over in Nicaragua, but it’s a significant multiple of all the times I’ve been pulled over in all my years driving in the States. Possibly ten times more. Police, especially traffic police, simply function differently here. They are paid a pittance. They don’t need a reason to pull anyone over; they pull drivers over and then look for a reason. Best case scenario, they ask for your documentation and then let you go. But often, they threaten to give you a ticket so that you will offer them a bribe not to. As best we understand it, this is assumed behavior that makes up part of their pay. It’s a broken system. Kim and I have both been threatened to be taken to jail before. I try never to pay a bribe, though I confess a few times I have felt completely over a barrel and given in. So after being pulled over dozens of times and starting to develop a really negative and hostile attitude toward everyone in a police uniform, I needed God’s nudge. Praying for them didn’t change my attitude instantly, but after practicing this for several years, it absolutely has changed how I feel toward police on duty here. Since I began praying for them, God changed my attitude toward agentes de transito–and, coincidentally or not, Kim and I rarely get pulled over now. This man’s offer of a handshake, a smile, and a friendly conversation, especially as I was praying to recognize encounters with God, became an encounter with God. Nothing big was at stake for me. The interaction didn’t change me, at least not that I can tell. But it did feel like an everyday miracle. *Police here mostly stand by the road and pull vehicles over. Very few patrol in cars or on motorcycles. Remembering the sermon at Moody Church that prayer can change our attitude, if God’s answer is No. That can be the miracle that God has for us.